Brer rabbit, also spelt Br'er, Bre'r and Bruh rabbit, is a collection of stories and tales of a rabbit living on his wits and surviving by tricking his foes and adversaries. The stories can portray the message that you do not have to rely on brawn or physical strength for survival or to get by, and also that not only the strongest necessarily win. 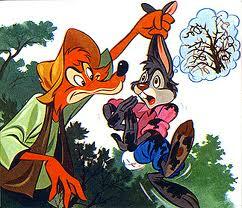 Br'er rabbit meaning "Brother Rabbit", has its roots in both African and Cherokee Indian cultures. The Br'er rabbit stories were brought to a popular audience in the late 19th century by Joel Chandler Harris (1845 - 1908), with the stories being famous as tales, being told by Uncle Remus. Uncle Remus was a fictional narrator of a collection of African-American folktales, by Joel Chandler Harris. Harris portrayed Uncle Remus as a kindly former slave in his latter years, telling folktales to children gathered around him, with Brer rabbit being the main character of these stories, often in conflict with Br'er Fox or Br'er Wolf. Although the stories had been orally passed down over the years, it was Harris who interpreted, wrote and published the stories. Enid Blyton, subsequently retold the stories as children's stories and Walt Disney adapted Br'er rabbit in its motion picture 'Song of the South'. 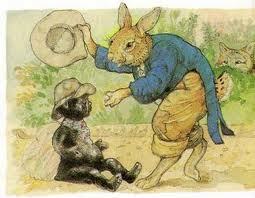 African origins for Br'er rabbit go back to tales of trickster characters and traditional folklore. Although, in the Akan traditions, the trickster tales are those of a spider, the tales are usually identical to those of Br'er rabbit. 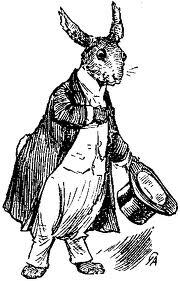 Some observers believe the American interpretation of Br'er rabbit and other trickster tales represented the enslaved Africans, who used their wits to overcome adversary, in addition to symbolizing a form of behaviour that might be used in certain circumstances in order to survive. The Cherokee origins of Brer Rabbit go back as far as 1845 when the "Tar Baby" story was printed in the Cherokee Advocate. A scene from the "Tar Baby" story shows Br'er Rabbit addressing the Tar Baby. Rabbit and hare folktales were common among the Indians of Eastern North America particularly under the name Nanabozho. It is impossible to tell whether the Cherokee tales came before or after the African American stories since such tales are passed down orally, told to children, passing travellers and the like.